2013… I’ve spent 48.5 hours in the air in the past 2.5 weeks and 12 hours in waiting lounges, thus the real food & low tox travel tips. It was an amazing solo trip visiting family in NYC and Paris. How lucky to have such a good reason to make the trek and enjoy life on the other side of the world for a couple of weeks! 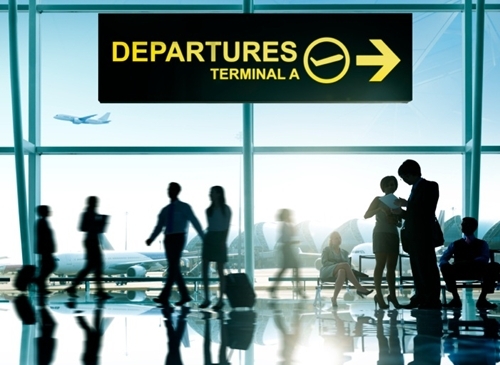 It can be difficult to stay healthy through the airport lounges and up in the air, if you’re not prepared and if you’ve got any food intolerances or allergies? Good luck! Even if you’re allergy free, once you’re tired and hungry, it’s an easy time to give into the surrounding crap – Especially if there are small people in the mix. 2018… Even though I wrote the above 5 years ago every now and then when I travel I add things / update them as needed and this year is no exception. Make a cake loaf / cheese bikkies / nourishing cake / anzac biscuits the legendary therapeutic choc chip cookies or coconut cupcakes for the journey and cool completely before putting into an airtight container. These will be fantastic to boost meal times, or stave off hunger in an airport / train delay. They will keep fresh for 4 days, no problems, and if you’re staying in an apartment with a kitchen, you could even freeze the leftovers (except the biscuits) for the next time you’re travelling. Take buckwheat / quinoa crisp breads and a good cheddar or gruyère if you eat dairy, which will be fine for 24 hours out of the fridge. Take a little jar of nut butter (decant the big one into a little airtight one) again to have on your crackers, or even to smear onto apple or pear slices. Take fresh, organic fruit. You just have to eat it before you arrive if travelling internationally, although Europe to Europe or US to Europe, there’s no fruit quarantine. Cooled roast veg will be fine for the day out of the fridge. Activate a batch of almonds / nuts with a couple of different flavours to keep things interesting. I did a salted caramel jar and a curry blend jar. Cherry tomatoes, Carrot and celery sticks – These will keep fine for a couple of days while travelling and are great to have for raw, fresh food – something definitely lacking on the travel front! Take a purple cabbage. Extremely detoxifying, you can put dips / fresh goat’s cheese in and roll and eat and crunch through them. You might find it weird, I find it to be a favourite plane food! Make a round of smoothies and freeze them the night before travelling. Keep in large container as will defrost much more slowly, and this will be cold for a good 6-7 hours after you leave home – note, for international travel there’s the 100ml liquid rule, so this is better for ground travel or if you’re travelling early in the morning to pack for the airport breakfast on the run. This chocolate breakfast shake is perfect for that. Pack some dehydrated crackers, that you can find at a health store. Flats are great with some great flavours. Gluten and grain free or make your own. You could also make a batch of the Free from lots crackers on the blog. So good and filling – 3-4 of those, some crudite sticks and a topping and that’s a meal! Pack a small jar of fermented veggies. Fermented / cultured veggies are wonderful for keeping the digestion going during long periods of sitting down and keeping your good bacteria aplenty, which while travelling means less chance of getting sick. They’re much more potent than probiotics which lose potency out of the fridge for too long. The cultured veggies are fine unrefrigerated for a day, and then back in the fridge when you get to your destination. For the full low down on fermenting your own veggies and getting started, head here. Pack some hard coconut pieces / coconut flakes. Super nourishing, filling and protecting against illness with the lauric acid content. Pack a few herbal tea bags. It took me a long time to admit that tea and coffee on an aircraft are both revolting and I was just saying yes for something to do! Prepare ahead and BYO! My faves are Pukka 3 Tulsi and Ovvio Mint As an aside, why does it always get turbulent when tea and coffee are served? Every time? Without fail? It’s weird. If you’re trying to avoid factory farmed meats, gluten and processed food at meal time, tick vegetarian and gluten free. You’ll be given most likely a salad or vegetable stir fry of some kind along with some pieces of supposedly edible cardboard. You can then fill yourself up on other goodies from home. Meat eaters – if you can find it at your ethical butcher, pack a packet of grass fed beef jerky. I loved skipping the horrific meat dish flying out of America to Paris, and enjoying a few bits of beef jerky, the salad, and some fresh blueberries and kale chips I’d picked up from the market in NYC that morning. A handful of nuts for a snack and voila. Fed and happy until landing 7 hours later. Consider travelling with a high quality green superblend to mix with your water, if you’re on a really long flight. Pack a lemon, halved, and have a couple of lemon water drinks throughout the flight to keep digestion working and act as a good tonic for the body. Pack a tin of sardines or mackerel (apologies to the guy next to you!) and half a lemon and seed crackers. A favourite, cheap and easy up-in-the-air meal of my son’s. Exercise as much as you can – even if you look like an idiot! I blow up like a puffer fish in the air if I don’t keep moving. Every couple of hours I do a few scissor twist jumps, lunges, plain jumps, squats and if it’s a 747 / A380, a bit of downward dog time in that back corridor near the loo’s. Yes, people laugh, but I’m feeling good at the end of the flight, despite the tiredness, and that to me is all that matters. Drink buckets of water and book an aisle seat. Yes you’ll have to pee all the time, but it will also mean you get up and move often. Drink minimal alcohol. A glass of wine to relax and unwind with a movie is fine, and if you’re a spirits drinker, switch the sugary / juice mixer for soda water and fresh citrus as the mixer. More than a drink is inflammatory and we don’t want any more inflammation than is already caused by flying. Get a good tea tree / eucalyptus saline based nasal spray and use liberally throughout the flight. Not only will it protect you from ear, nose and throat infections that we’re prone to when travelling, but it will also keep your airways working well and stop blocked ears most of the time. I use the metagenics one, which is practitioner only that you need to get form a health store that has a resident naturopath, or a colloidal silver one. Both are great. Consider taking a natural anti inflammatory product such as some homeopathic arnica tablets for any stiffness or swelling. Consider investing in a good magnesium chelate supplement to relax and nourish your muscles and keep your system detoxifying well. Use your low tox face wash to wash your hands too – The toxic stuff in the airport and air plane bathrooms is not good news and the last thing we need while under already very unnatural conditions, is to be hit with pthalates, triclosan and parabens. Get a tourmaline necklace like this one. I have a big tourmaline block at home for it’s electro magnetic protective effects. It lives next to our wifi modem. I tried wearing it for the first time this trip on the flight back. Truth be told, it was something I saw at Dubai duty free and after 16 hours of travelling and before a 14 hour flight? Well let’s just say that if there had been a product made from recycled paper that promised me wellbeing while flying, I’d have bought it. I put it on. It was very warm to the touch after take off, and then cooled right down after landing. Spooky. I also felt physically far less swollen than usual and just wonder whether this little disc might have played a roll. Researching for another post on this for the next couple of weeks but the product information said it was excellent for circulation and oxygenating the blood and I genuinely felt much better than usual after a long haul. Use the eye mask and ear plugs to block out the surrounds and get some deep sleep – even if it’s just a couple of hours at a time. Get yourself some magnesium oil spray. It will help you sleep with a few sprays to the feet and protect from the pins and needles and cramps you can get while sitting still for lengthy periods or sleeping in a contorted sitting position – I just had a flash back asking the stewardess for my fifth pillow and then an hour or so waking up on the lovely british backpacker’s shoulder who was sitting next to me. Oops. Awkward. I usually travel with the husband and have ‘access’ to two seats. Apparently not this time. Try, awkward as it is with those little basins, to splash your face with water and moisturise with coconut oil or your preferred natural moisturiser. You’ll feel great for it. Our body craves ‘back to body’ experiences like water, grass, sun to balance itself. Water is the only one we have up in the air and it really helps. Meat, dairy, veggies will have to be eaten by landing, as most customs / quarantine will want it handed in. That doesn’t mean don’t pack them – it just means, only pack enough for your flight as it won’t be coming off the flight with you. Baked goods, crackers, nuts, superfoods are fine, so you can pack for well into your journey with those, especially if you’re travelling somewhere you’ve not been able to find a good local health food supply for. We went to fiji a couple of years ago and packing zucchini bread, activated almonds and muffins baked at home was the best thing we could have done. Without much budget and an ‘ok’ hotel, it meant on our touristy days, we didn’t have to eat from road side ‘coca cola / twistie stalls’ with limited options. Your glass keep cup is absolutely fine. I travel the world with one zero problems. Travelling domestically, there is no liquid restriction so fill your reusable bottle to the max to avoid single use plastic bottles. Find a patch of grass or sand and hang out barefoot (weather permitting) for at least 10 minutes. Earthing yourself charges your body with good energy, boosts circulation and reduces foot swelling so quickly, you won’t believe just how much and how fast, until you try it! If you really want to geek out, do a before with shoes and after with shoes. Yes, I did. I did that. I am a complete nerd. Failing the above, you can reduce your swelling with a 10 minute cold water splash of the feet under a bath tap. Have an epsom salts bath (pack your salts in case you can’t find any on arrival anywhere). Get direct sun if weather permits. Don’t even wear sunglasses. 10 minutes is all your body needs for the ‘Yep, it’s day time’ message. Save a fortune on breakfasts and avoid refined grains, unethical eggs / bacon and a generally sugar laden start to the day by getting a couple of punnets of berries and natural yoghurt, an avocado / spread of some kind like nut butter and a packet of crackers of your preference. If you drink milk, also get your milk of choice for tea / coffee or the little ones because long life milk and creamers are some of the most processed products going around. Lots of food allergies in the family? Probably best to get an apartment so you can shop and cook and not have to be upset if there are limited options for you. Being upset on holidays is no fun! Have a look on Airbnb.com. While it might seem it, I don’t feel OCD at all while travelling. I have a wheat allergy, so for that alone with the average airport / plane offerings, one has to be prepared so one doesn’t go hungry. I eat normally in a restaurant, except deep fried to avoid GM oils and vegetable oil in general and I do a little research on ethical options and delicious places I want to dine in in advance, so I don’t have to take chances on quality factor and waste money on crappy foods. I don’t worry too much about whether produce is organic while I’m away, but if there’s an organic option, then sure, that’s what I go for. Fresh and local is my focus and all the flight stuff is with the motivation of arriving tip top healthy, in shape and ready to go, as opposed to loaded with processed foods and swollen like a michelin man and needing to lie down for 2 days. Who’s got the time for suffering, when you’ve arrived in the amazing NYC? 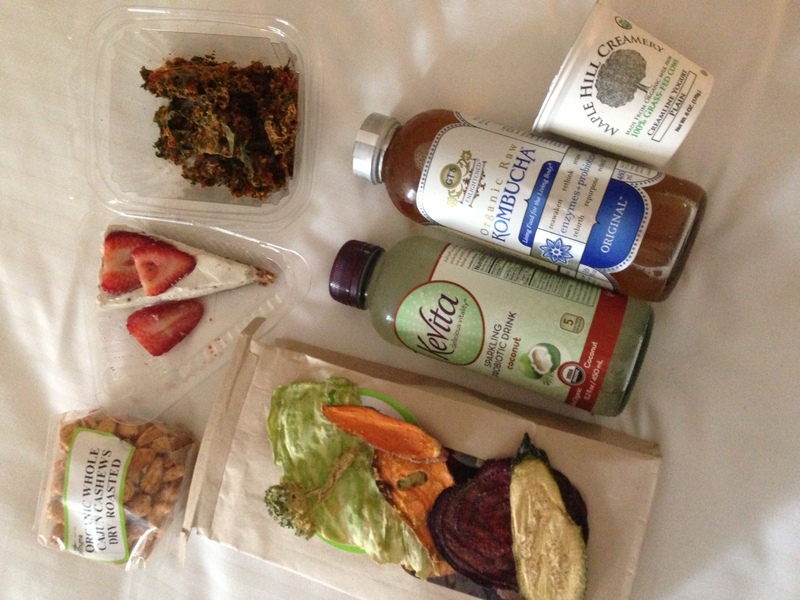 Delicious treats including kale chips, natural yoghurt, raw cheese cake, kombucha probiotic drink and veggie chips from Life Thyme, NYC. 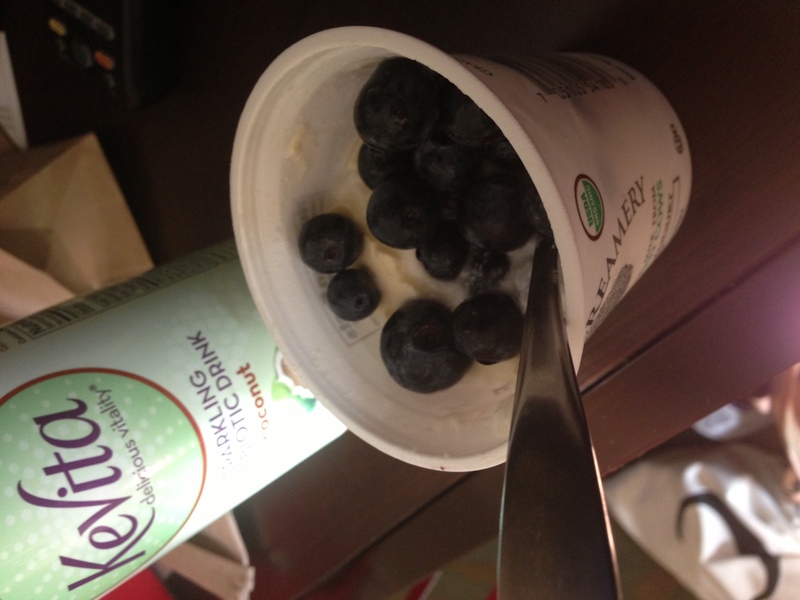 Cheap organic breakky with bluberries from the market and natural yoghurt that I popped in the mini bar fridge at the ready. 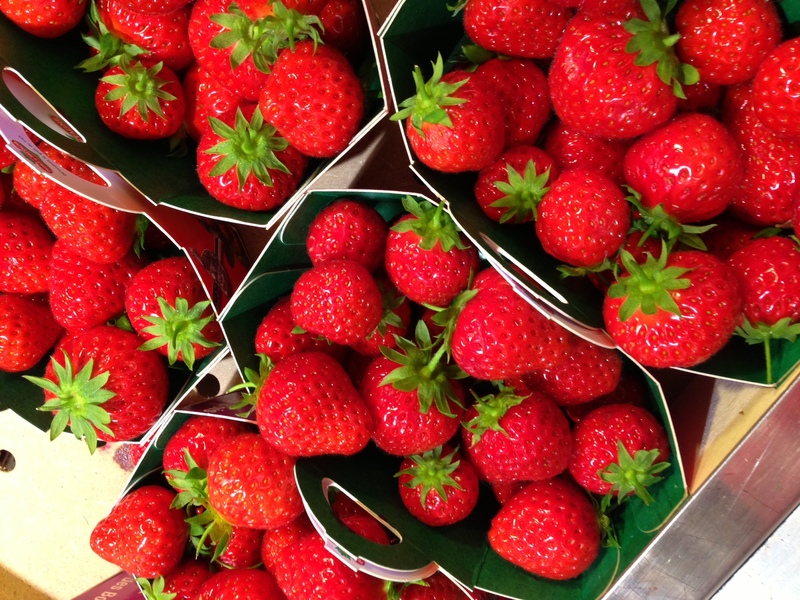 Mara des Bois Strawberries in season late spring / early summer in France. Out of this world. How on earth could you walk into a McDonald’s knowing this exists!? Wild Asparagus from the Versailles markets, just outside of Paris. 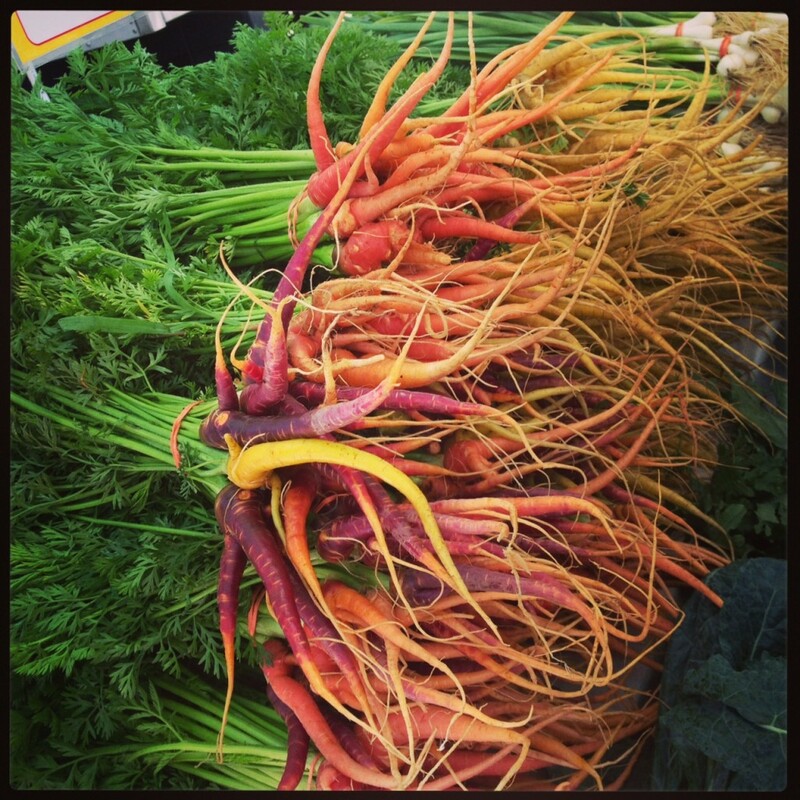 Union Square Markets, NYC – Best Carrot display ever? I think yes. 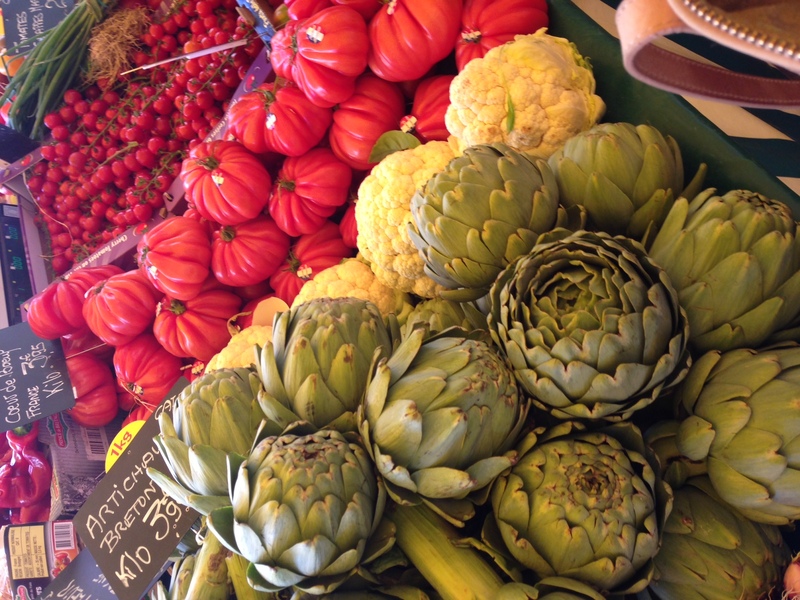 Real Food, Low Tox Travelling = Ready to explore. Those are my long haul travel tips. Now it’s your turn. What are your rituals? Tips? Ideas? Tell me! Thanks Alexx! I am definitely going to use this list for when I prepare for my flights to Europe – hopefully I’ll get it right this time and not walk around like a zombie blimp for three days after landing. Super amazing tips thanks Alexx! I will be spreading the word far and wide! And thanks for the shout out too! Thanks for sharing this awesome list. While traveling its very important to take care of your health and your post gives exactly the same ideas on what people can eat while traveling. Thanks Liz, I was shocked at Paris having popped up all over the place with Subway and Starbucks too. Devastated in fact. I’m French on mum’s side of the family, and hadn’t been back for 6 years, so it was a really noticable change. 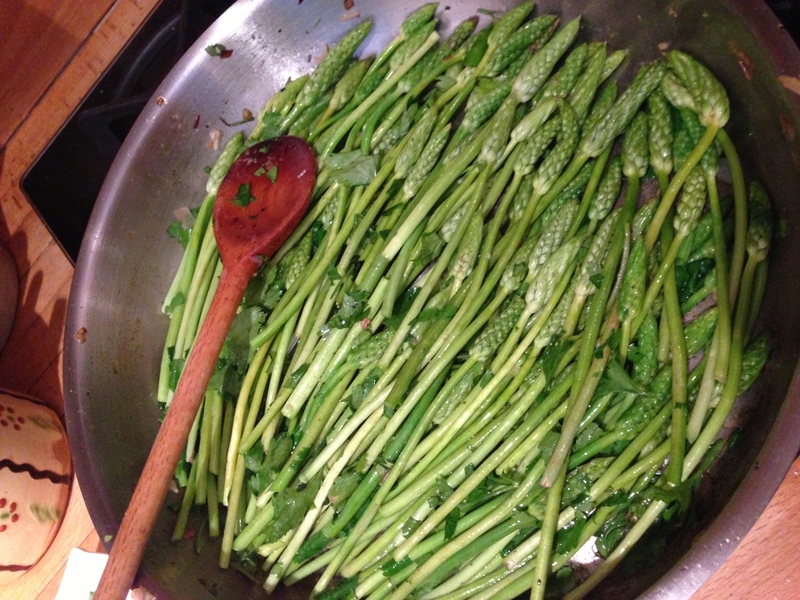 Thank god the produce markets are all still in full force and yes – that wild asparagus, which literally just grows wild that time of year typically by the road side, was absolutely delicious. Could not be better timed! Thank you! We are about to go on my first ever long haul trip in September and I’ve been stressing about how to manage the food situation and feel healthy after 26 hours of flying – now I know! Thanks! I already love a lot of the products mentioned & some good tips – particularly the Olive Leaf & Arnica. What dose of Armica do you recommend to avoid swelling?